I've got sort of a thing for organization. I like to know what's happening and when, and I don't like to be late. Every year around fall I start recognizing a need for a new organizer. Last year I got the Franklin Covey, but it's just too dry for me anymore. 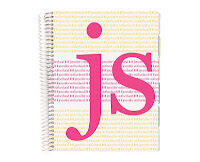 A friend recommended this great life planner from Erin Condren, and now I want one. The picture is sort of representative of what I want, but I prefer the purple and orange, and I want my initials to be B2. Cuz that's how I roll :) I don't need any of the extras, and I want my planner to run from Jan 2013 through Dec 2013. I wish I could have this right now! Luckily December isn't too busy, so I should be able to keep my life straight until Christmas.